Municipal Corporations of every city in India are vested with the responsibility of governing those areas that are very large. The area that falls under every Municipal Corporation is further divided into wards and these wards are taken care by the Councilors. Every ward or a group of wards that is present within a municipal corporation possesses its own separate administrative body known as ward committee. Similarly, there are a total of twenty-six municipal corporations in Maharashtra and Malegaon Municipal Corporation is one among them. The civil administration of the city of Malegaon was previously carried out by Municipal Council operating since the year 1863. Municipal Council of Malegaon was transformed to Municipal Corporation and it came into effect on 17th December, 2001. The Municipal Corporation of Malegaon is under the supervision of the Bombay Provincial Municipal Corporation Act of 1949 and it is compulsory for the Municipal Corporation of Malegaon to provide some of the most basic infrastructural means required by people such as drainage, health, sewerage, roads, education and water supply. There are a total of 72 wards that comes under Malegaon Municipal Corporation. Malegaon serves as the administrative headquarters of the Malegaon sub-division that is constituted of Chandwal, Nandgaon and Malegaon Tehsils or Talukas. Additional Collector serves as the head of the revenue administration in the Malegaon sub-division and is supported by a sub-divisional officer and even the Tehsildars of the three Talukas. The Malegaon Assembly Constituency consists of one Talathi Saza and one Revenue Circle. The city of Malegaon consists of ten courts that are located in the western side of the city which is called the camp area. 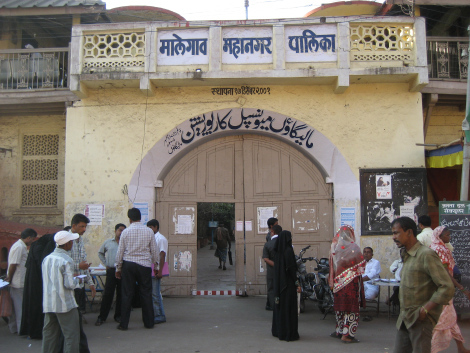 The courts that are present in Malegaon deal in various types of cases such as criminal matters, civil cases, family disputes, marital disputes land disputes and property matters. The main courts that are found operating in Malegaon are Sessions Court, Judicial Magistrate First Class Courts, Senior Division Courts and Bar Council of Malegaon. All these courts in the city work in a very sound and quality based manner and the people are found to be greatly satisfied by the services of such courts. There are no prisons or jails found in Malegaon but the police stations do have a special cell for those who are arrested and are required to be carried to the courts for the charges. Most of the police stations in Malegaon are equipped with such cells that are of great importance for the supervisors in the police stations.